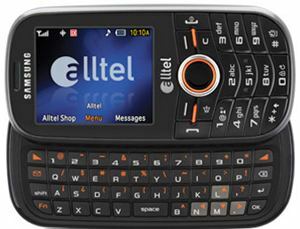 Alltel Wireless and Samsung Mobile have recently announced the launched of a new messaging handset which called as Samsung DoubleTake. The Samsung sliding phone has been featured with QWERTY keyboard for improving messaging functionality. The Samsung DoubleTake is featured with a 2.1-inch TFT display with 176 x 220 resolutions. It is also equipped with a 1.3-megapixel camera, integrated with media player that supports MP3, AAC/AC+ and WMA9 audio formats, has built-in 128MB of internal memory, and comes with a battery that provides up to 250 minutes of talk time and up to 300 hours of standby time. In addition, it is Bluetooth enabled and supports up to 16GB of memory expansion. Available in bold red and sleek charcoal gray, the phone with measure 2.09 x 4.25 x 0.65-inches and weighs about 4.06 ounces is now available at all Alltel retail stores and online from the carrier’s website. It is priced at $39.99 with a one-year service contract after a $50 mail-in rebate.